The wedding is so close now, and we’re starting to flesh out some of the finer details. One of our most recent discoveries is that (in Islington at least) a civil partnership ceremony doesn’t have to follow a fixed format, and our registrar has encouraged us to make the ceremony our own. The only bit we actually have to have is a few specific legal declarations that must be made in order for the partnership to be valid in the eyes of the law. So if we wanted our ceremony to be a tribute to the last scene of Star Wars (with Donny as Luke, and me as Han, obviously) we could. We did play with some ideas, but we soon realised that the traditional format of a wedding service is so firmly embedded in everyone’s minds, if we stray too far from that we could end up reaching the close of the ceremony just to discover that everyone is a bit unsure as to whether we have actually got married or not! So what we’ve come up with is a fairly conventional ceremony with a few creative twists. The biggest change we’re making (compared to the example ceremonies the town hall sent us) is to switch the order of everything round. Most of the examples finished with the legal declarations and the signing of the schedule, but we’ve decided to do that bit first. The reason for that is to make it very clear to everyone which part of the ceremony is about us entering into a legal partnership, and which part of the ceremony is about us making a personal commitment to each other. We want to keep the two parts separate, and the signing of the schedule will provide a convenient interlude between the two. It’s the second half of the ceremony which is the most important part for us. That will be where our friends and family will witness our promises of commitment, and where we have the symbolic component of giving and receiving rings. We want this section to be the climax of the ceremony – rather than finishing up with a rather dry and stiff signing of a legal contract. Damn, I was looking forward to using my Admiral Ackbar costume. Love how things are progressing. This will be the [gay] ceremony to define all future [gay] ceremonies! Might I suggest Pikachu don a jacket, at least? 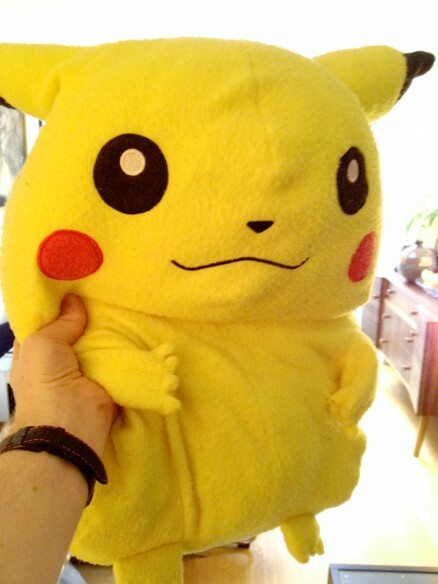 Pikachu would make an awesome ring pillow. Just saying. Instead of a ring bearer, we decided to go for 8 guinea pigs yoked to a miniature sleigh. It’s been hell getting them to run in a straight line though.